The paint we have used for many years is a professional grade liquid tempera manufactured by Dixon Ticonderoga under the brand name Prang. This has been discontinued, although Stewart still uses this paint in many of his workshops. The ones we suggest now are: Blick Premium Grade Tempera or RAS Tempera (Jerry's Artarama). We suggest the 16 oz sizes. 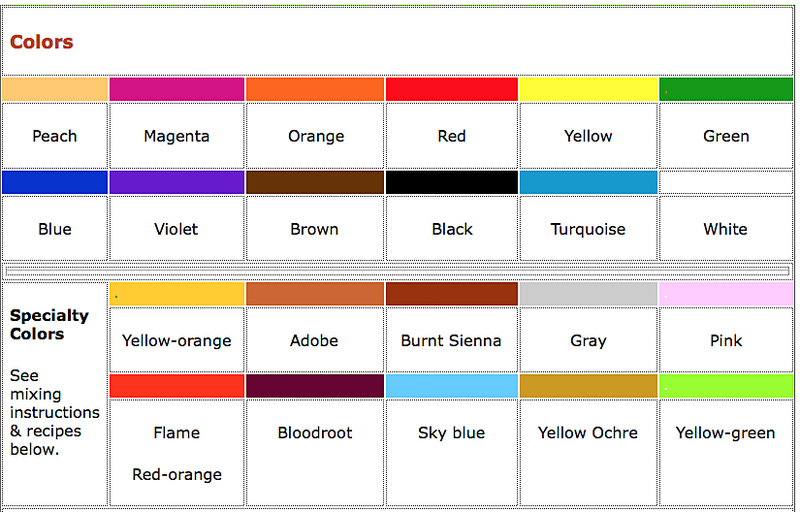 Below you’ll find the colors we use and mixing instructions for the specialty colors. See mixing instructions & recipes below. It's best to mix paints into a covered container or jar so you have enough to use for a while. Start with the lighter color and slowly add darker colors a bit at a time until you get the shade you desire. The parts refer to any unit of measure. Pink, Sky Blue and Gray: Start with white, slowly add a tiny bit of: Magenta for Pink, Turquoise for Lt. Blue, Black for Gray.